At the moment, I’m feeling more into the first phase of the aesthetic – loving all that asymmetrical drapery, knots and volume in the skirts! Yum! Since making Tree last year, I’ve also gotten really enthusiastic about structured foundations so contrary to how it usually goes I was actually eager to build these pieces before starting on any pretty pretty dresses (but, oh, what I have planned!). These didn’t all happen at once, I made them between September and November 2014, with the chemise being finished early-mid January. 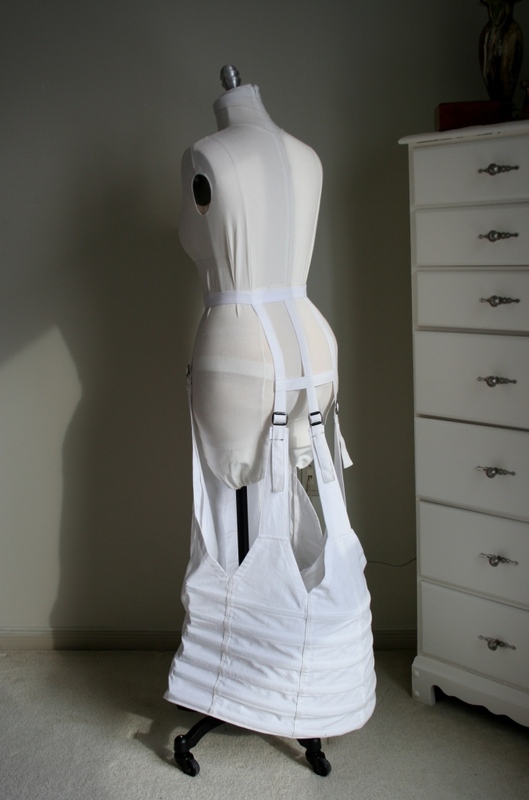 I also made a new corset, but I think that deserves its own post! A big shout-out goes to Jen Thompson of Festive Attyre for inspiring several of these pieces, and thus consequently the full set. She made a hip pad, hooped petticoat and flounced train to go under her Natural Form ballgown a year and bit ago. 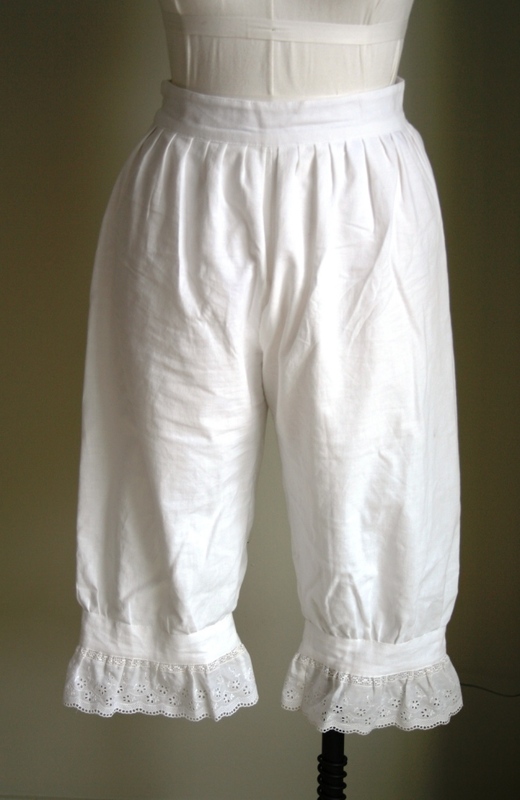 She presented comparison photos of the great difference the underpinnings made to the look of her dress, convincing me that if I wanted to start down the Natural Form rabbit hole I needed these first! Check out her great post here. 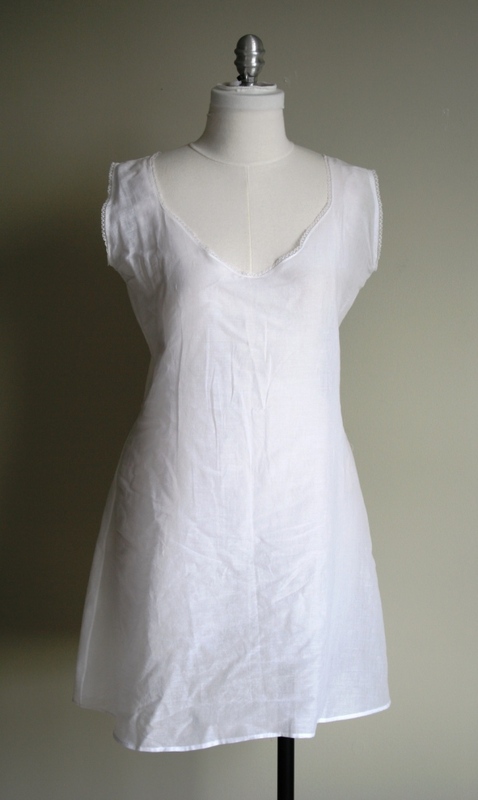 The first piece I’m showing, the chemise, is the most recently completed. 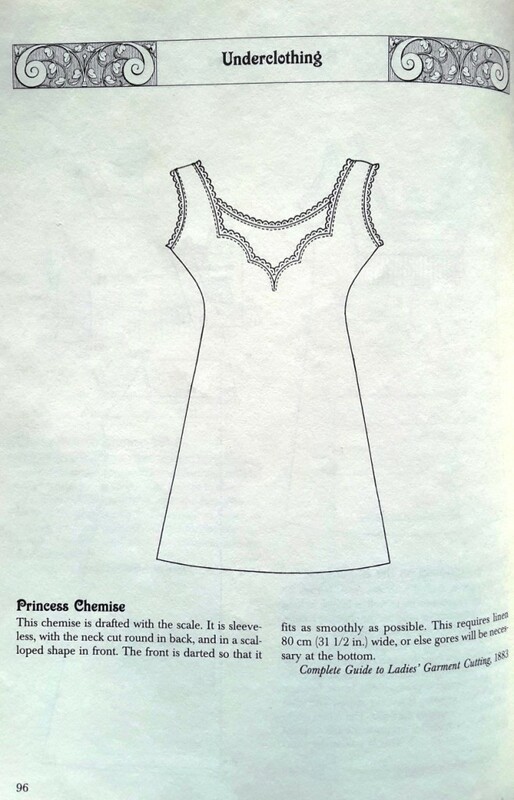 I had started it first but it didn’t go well, so I left it for a while and came back to it this month for the first Historical Sew Monthly 2015 challenge, which is foundations. 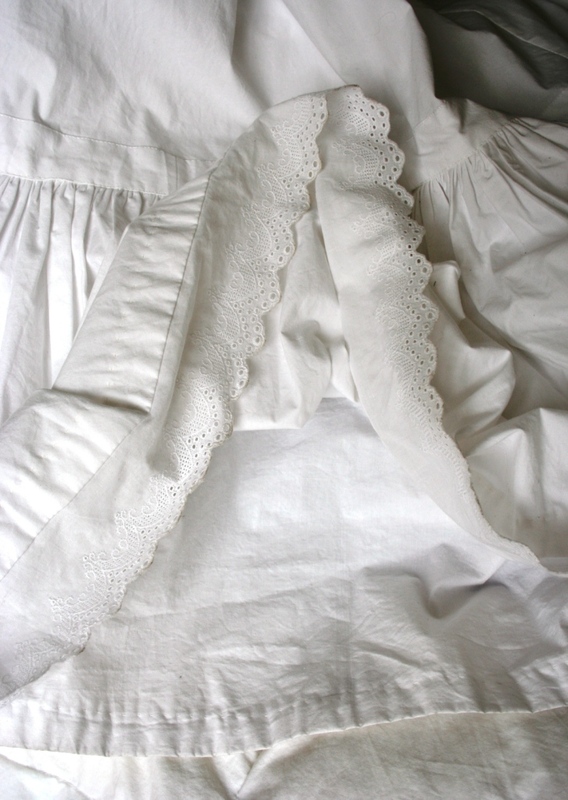 It’s made from this beautifully light and floaty cotton voile that I initially intended for a late 18th century fichu/handkerchief. That was some years ago, so it wasn’t a big wrench to change my mind and I love having so light and non-bulky under my corset! While it is finished, I’m not totally done with it. I’ve decided to change the lace trimming around neck and arms. I’m waiting on some vintage insertion lace to arrive that I’m going to sew to the chemise edges instead, and add the lace on it now to the edge of the insertion lace instead. 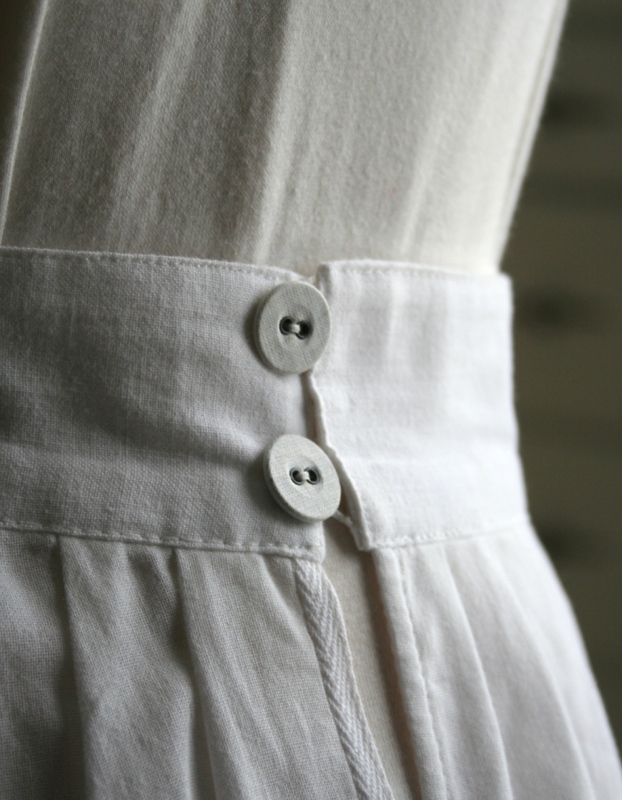 I was quite proud of my 1/8″ French seams! And yes – they’re split! And I can personally attest that once you go split drawers you won’t go back! They’re made out of white cotton from an obliging Value Village-sourced bed sheet. My favourite part of these are the two vintage/antique cloth-covered buttons from my button stash that I used for fastening at the side. 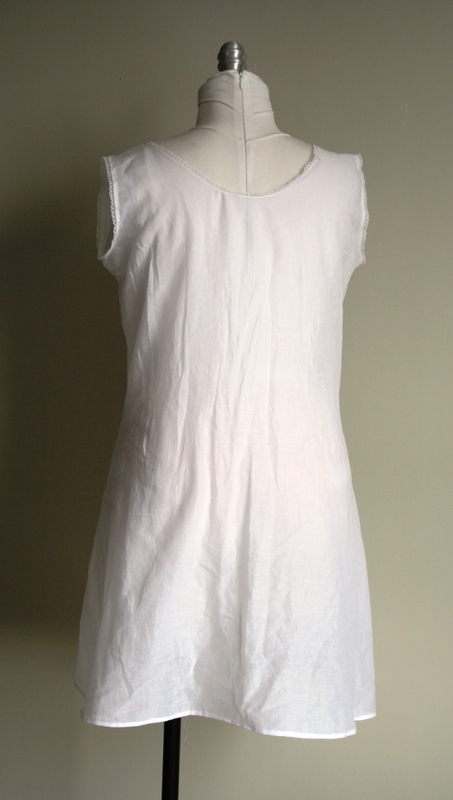 For this I used white cotton pillow-ticking. I wanted something fairly lightweight but still crisp, which ticking’s tight weave amply provides. 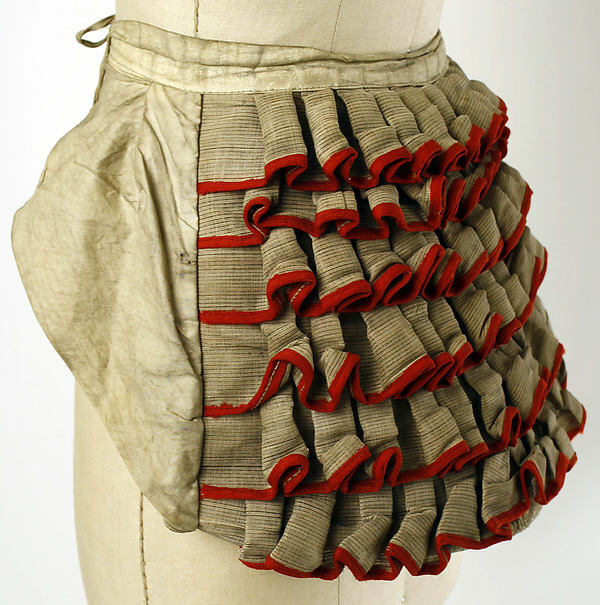 The petticoat itself is full length with the bottom flounce applied to it. While I really like the extra bit of body and substance this provides, the hem is forever getting caught up underneath when I put it on. 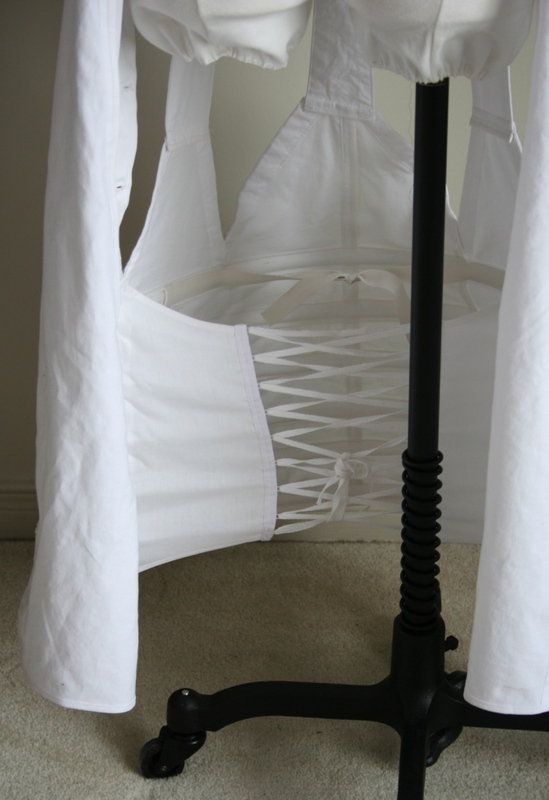 Underneath the petticoat are two nifty types of support! 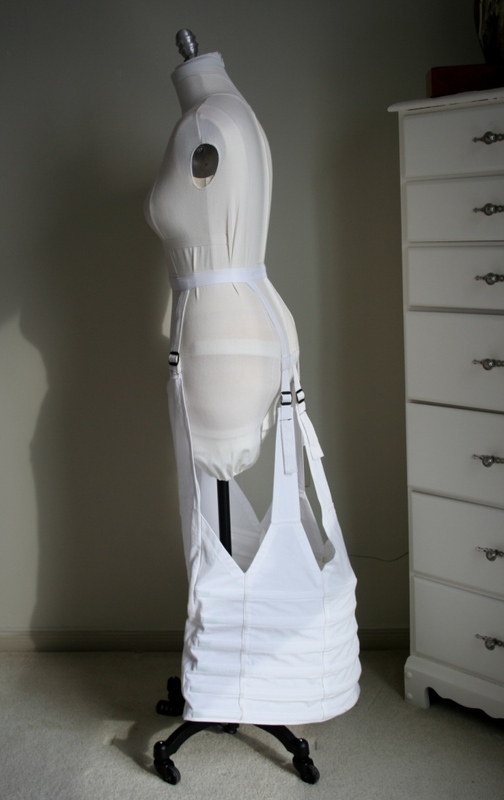 This was the piece that kind of inspired the whole lot of these underpinnings. I thought it was just fascinating when I saw Jen Thompson’s version! Mine is made from white cotton twill canvas that I had in my stash. 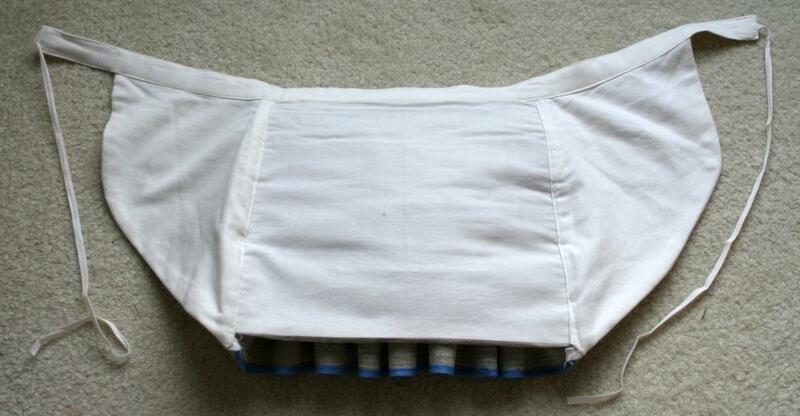 The adjustable straps and the waistband are cotton twill tape, doubled up. Those are safety pins you see below the buckles. The buckles I got aren’t quite toothy enough to hold the straps when you start adding layers over top of the petticoat so until I address that the safety pins keep everything in place. 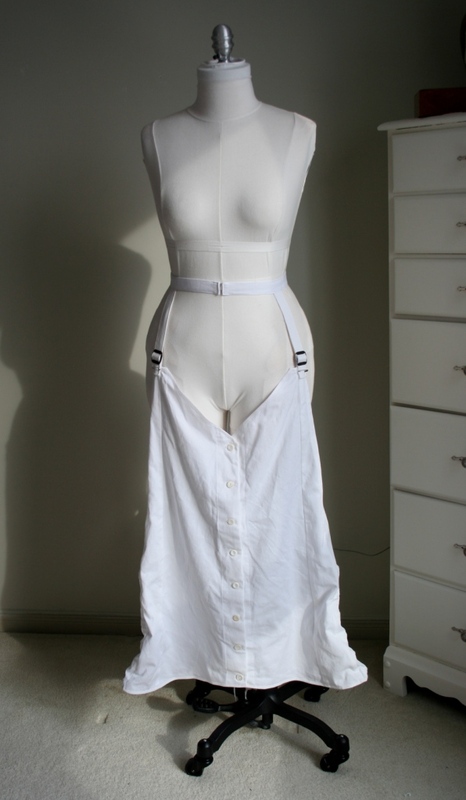 I’m not too bothered by it at the moment, still just too excited about making this! In addition to also leaving off the front vents I followed Jen’s example by making the inner panel lace-up so it can be more adjustable. One note about the placement of that panel – if you ever decide to make one of these you may want to situate more forward than the pattern indicates. The way I read the pattern (possibly incorrectly) is that the panel should be placed at the first set of seams beside centre back. I did this initially and found it didn’t give the right shape. I removed it, then decided to split it in half and have it lace-up, and moved it to the next set of seams. This did the trick! 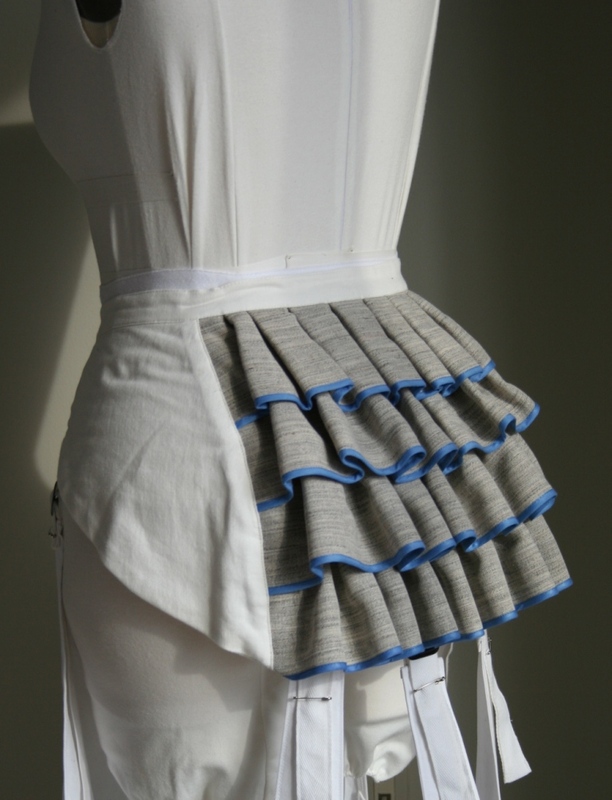 The second support is a small bustle pad – which I think is the cutest piece of the bunch! My reference here is the one on the far left. These are at LACMA. 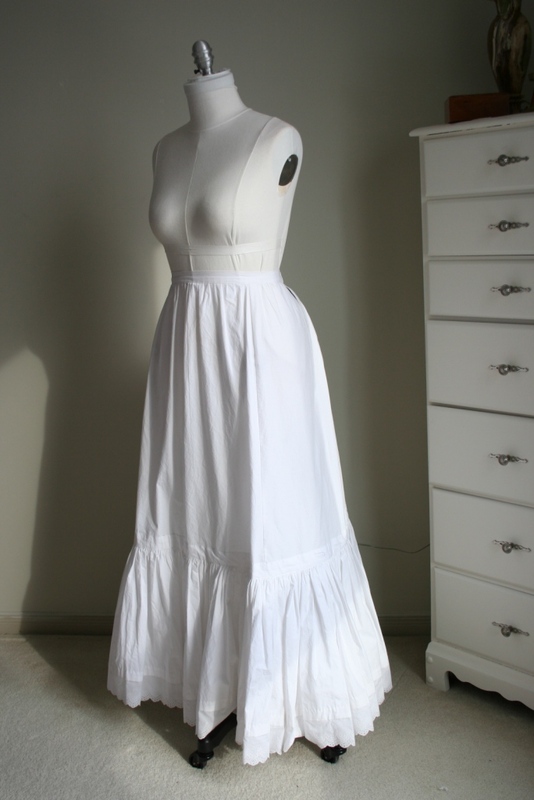 My primary reference was the first one, but with fewer tiers and less controlled box pleats similar to the second one. This doesn’t add a lot at the rear, just that extra little bit you need for the Natural Form silhouette. Ahem. 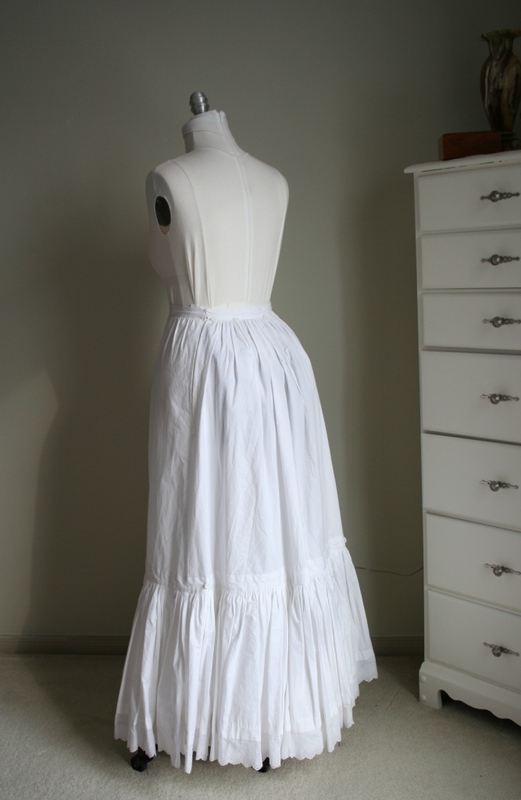 It’s made from more of the white cotton pillow ticking that I used for the petticoat – to which it is also mounted. 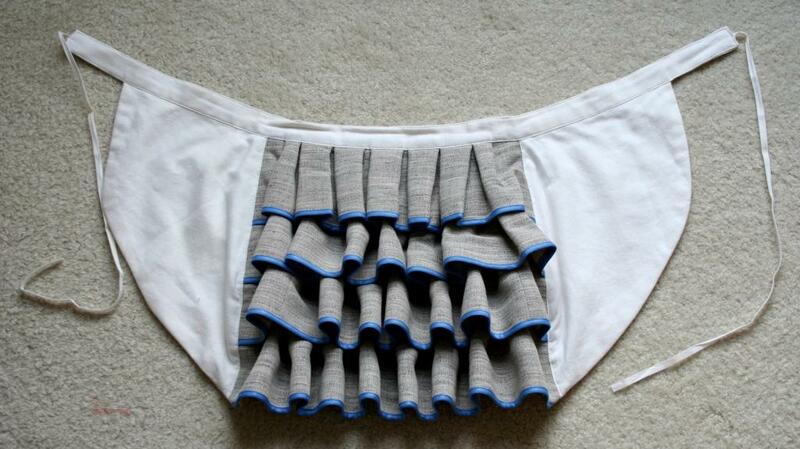 To be honest, if I were to do this again I wouldn’t use the ticking for the ruffles. While it’s perfect for the base, using it for the ruffles makes it rather heavy and I fear it causes more drag than is ideal. I’d use cotton voile or lawn instead. This one is still definitely useful (and beautiful!) but will work best under the really narrow skirts of 1880-1882 than the fuller ones of 1876-1879. 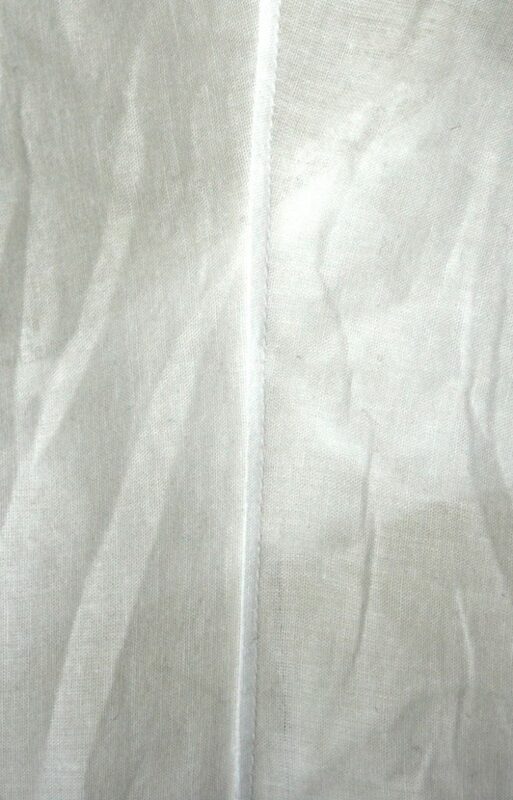 I used some scraps of the cotton sheet to bind the edges (all the rest of the ticking was used up on ruffles!) 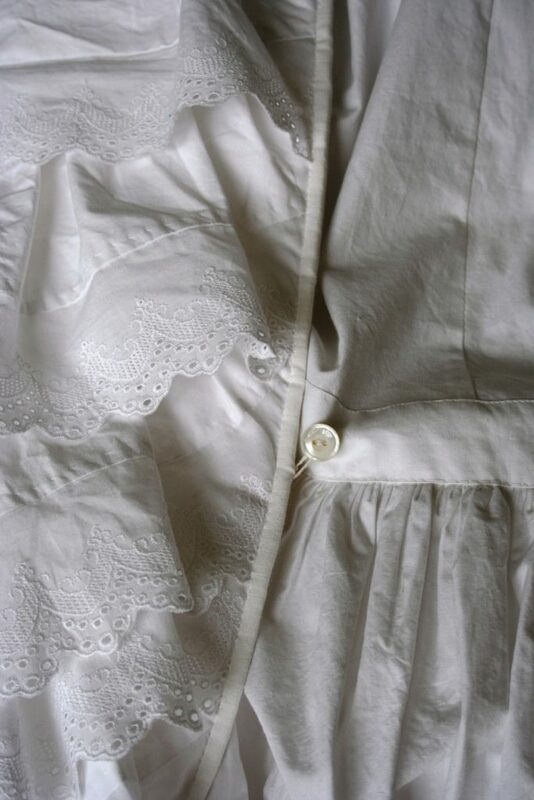 and added buttons to the sides of the petticoat and thread loops to the train to keep it in place. I think I’ll add one or two sets more for added stability and security. The buttons also need to be replaced with shell ones. I’ll try to get a picture of my in all of it as part of my corset post. 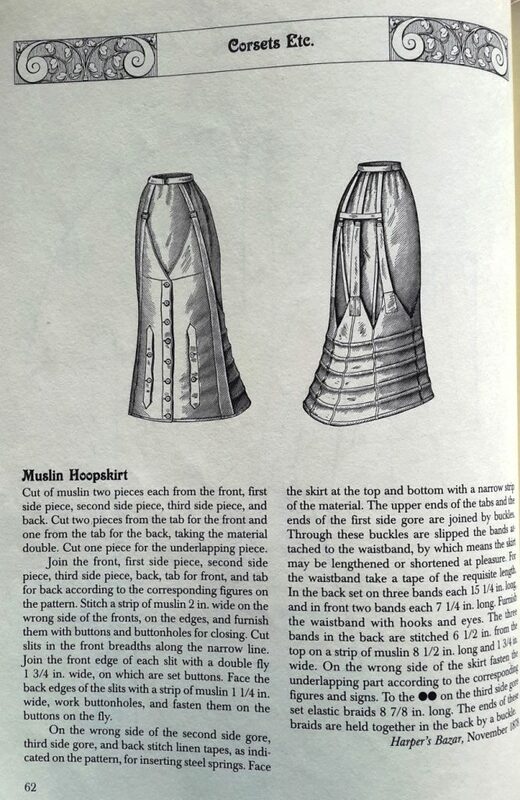 How do you feel about making foundation garments (historical or modern)? Love ’em? Hate ’em and can’t wait to get to the good stuff? Wow, that’s a lot of pieces and all of them so perfect! Your overall silhouette will be so accurate! Actually, so far so good. 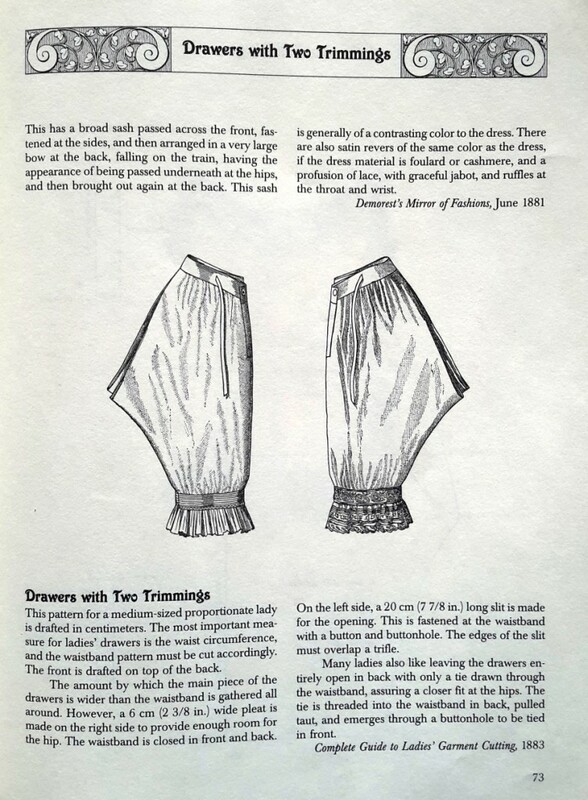 I did a fitting of a Nat Form/1880s tea gown today that I’m working on and these along with my new corset made such a great shape, I’m very pleased and excited. I think you did a great job on all the foundation items. Gave great advice for changes. Beautiful! I am in awe. I just got this book and I have to say I felt a little intimidated. I am happy to see someone using it and I feel inspired to try. They are a great resource and I love that they allow you to make pieces from original patterns. 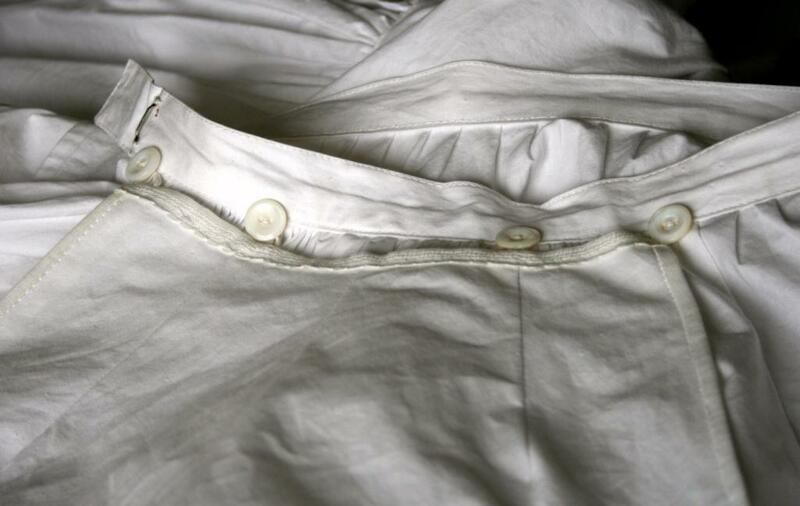 If you’re feeling nervous maybe you could start with one (or some) of the underthings like a petticoat. Or even try one of the skirts. Oooh, 18th century? Or 16th? 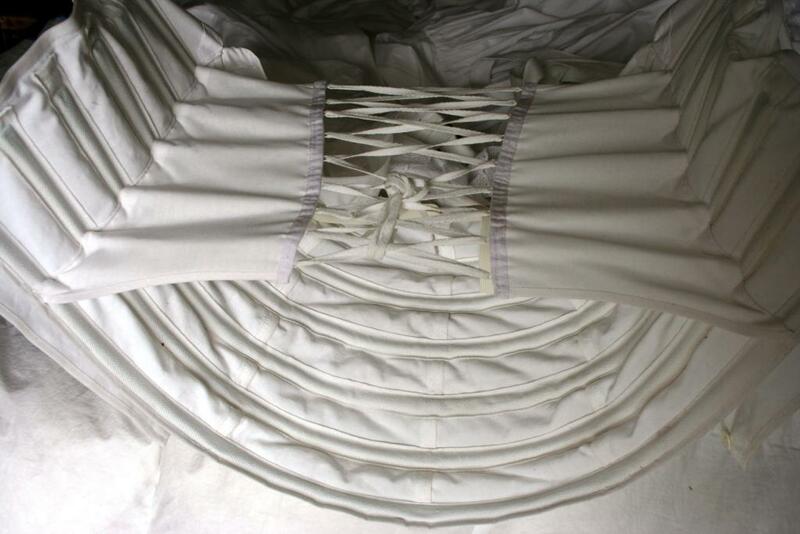 I have plans to do a set of late 18th century unders and overs as well…hopefully sometime this year…hopefully. I don’t think you should worry – after stays the dress will be easy! My new stays are 1810, I’ve already done 1775 but will be redoing some of that era at a later point. Still have to do the stockings, but I have at least now spun the yarn! Definitely a substantial foundation! 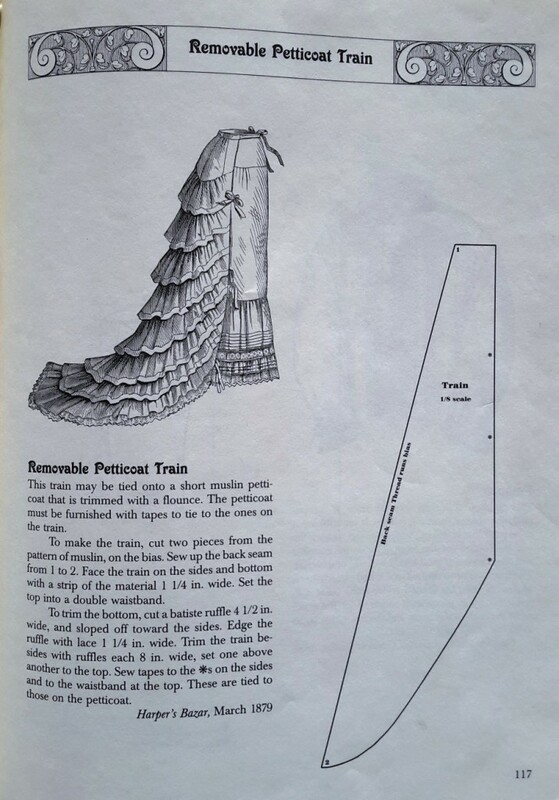 The train is lovely with the ruffles cascading down. I love this period and am very excited to see your progress! 🙂 Yay! Thank you! I’m quite excited to see I put over all this myself! Thank you! Every time I look at your post I have a history lesson! The work you, and others like you, do is amazing! I made my Barbie doll into Queen Elizabeth I (proper clothes) when I was young and I thought that was a lot of work! That’s fantastic about your Barbie and I don’t doubt it was a lot of work. Doing things in miniature present their own challenges! Ah well… It was fun, it looked good, but I am sure it lacked the details you put in. Like I said.. You are more historically accurate. I love seeing your “makes”. Your work is beautiful! 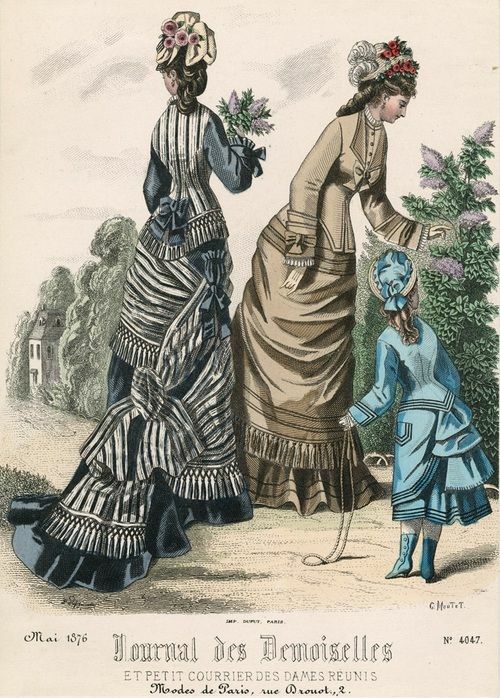 And I can’t be anything but amazed that this was actually what a woman would wear. I’m thinking a warm summer’s day and all those layers and just the weight of it… I’m thinking a grim autumn’s day when the warmth is welcome but imagine getting caught in the rain witht that train… (And then washing it all by hand…) It’s so fascinating. 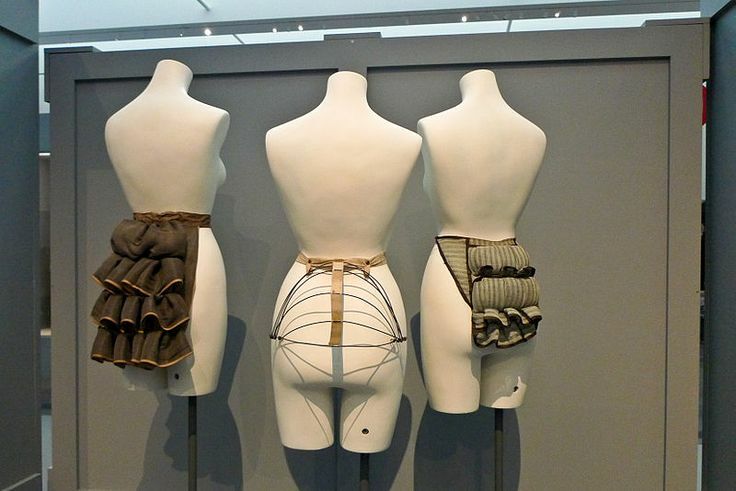 The “average” woman wouldn’t wear anything so extravagantly impractical, at least not for everyday. 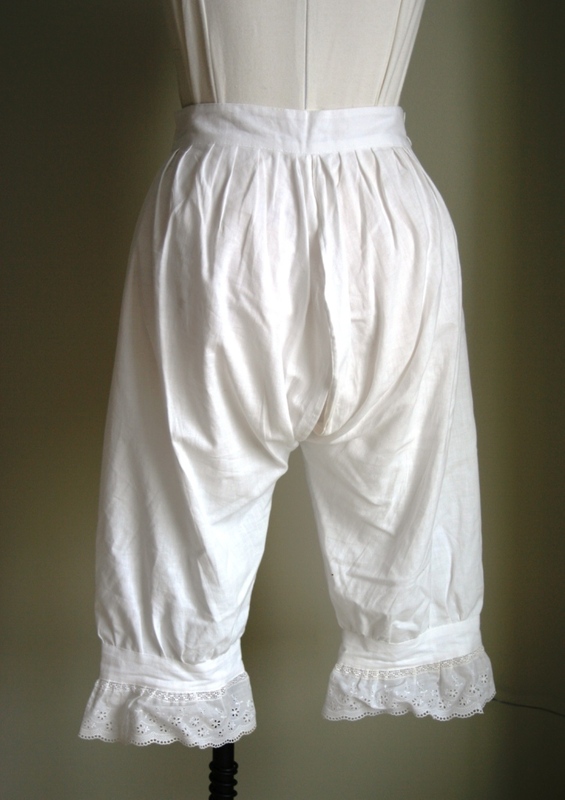 A woman who would wear these undergarments (and the ones that would go overtop) probably has a small army of maids and laundresses at home. 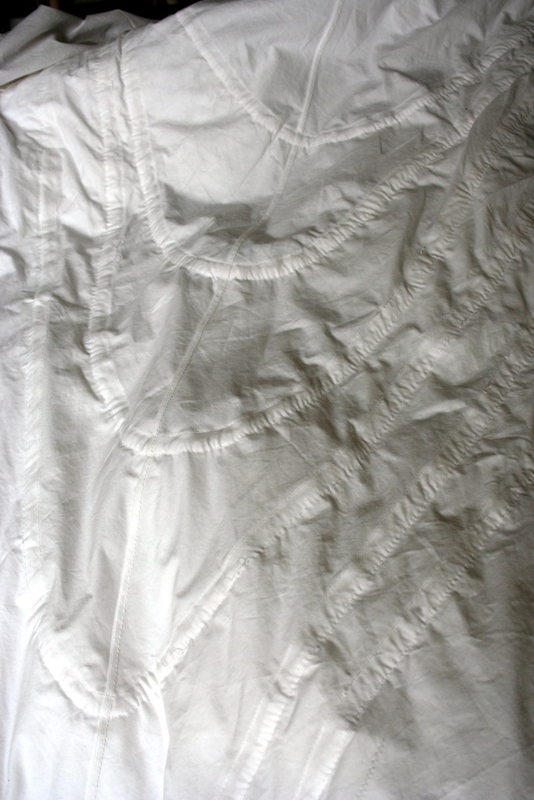 One of the reasons I chose the fabrics and the particular cotton lace edging I did was for machine-washability! Thank you! Having beautiful undies really does make a difference to how you feel in something! These are all gorgeous! You really did a beautiful job. Excellent work (as always). 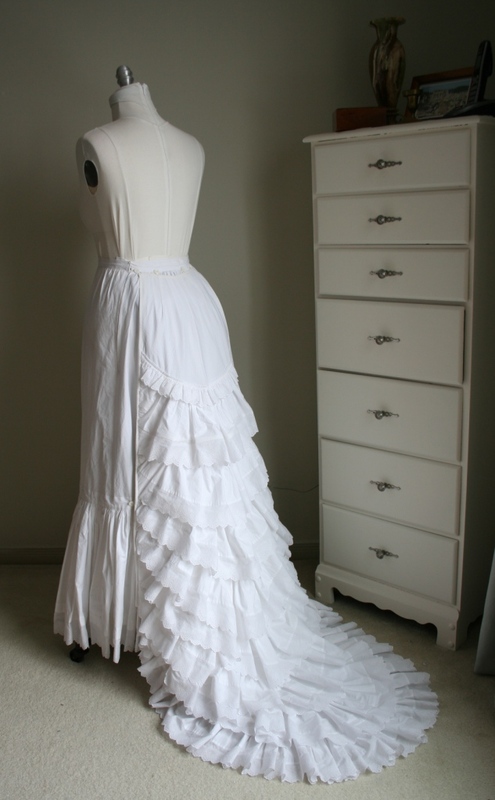 I would just wear the bustle and hoops over black and call it fabulous. I love the structures and textures! Such a lovely thing to say, thank you! And I hope by inspire you mean that it make you want to make your own pretty things – and then you actually do! That would be the best! 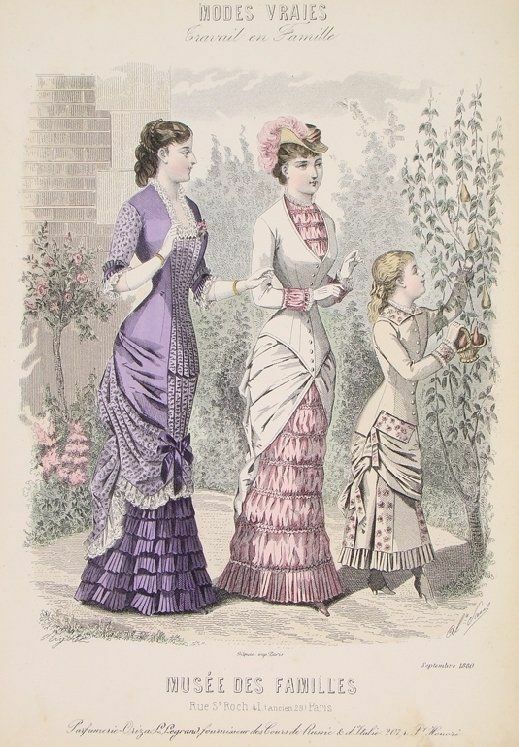 I hope you don’t mind, I put your article on my facebook page – with full credit to you for your talented sewing, photos and research – I was just discussions your sewing with a co worker today and I had to show her and another lady what lovely work you do and what women used to wear! Thank you! How could I mind such flattery? Thank you! I hope you don’t mind a quick question: I have been drooling over Natural Form for some time, but I’m worried about being able to walk with the hoops so low. Have you had a problems with that? Your ensemble is so beautiful!